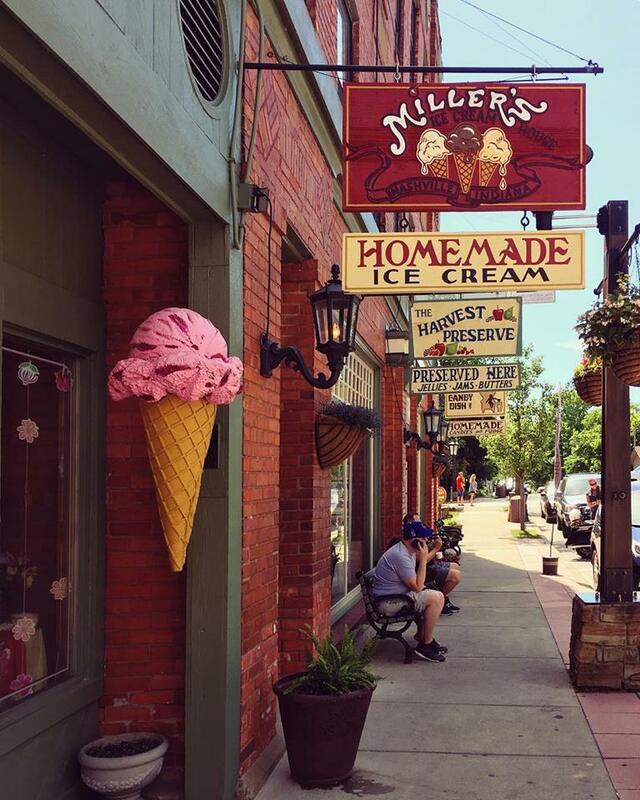 We’ve been serving real homemade ice cream in Nashville IN since 1977. Our 23 famous flavors plus one special seasonal flavor are always in stock and are all made the old fashioned way. You can enjoy your ice cream in dishes; cake or homemade waffle cones; in shakes, malts and sodas; on our homemade cobbler; on persimmon pudding, and in sundaes. The next time you visit Brown County, be sure to stop by to sit on our porch and enjoy our piano music. You can watch it being made several days a week. In the Fall we make over 100 gallons a day to satisfy the thousands of customers who come back every year. We mix and freeze our ice cream the old fashioned way, in a wooden tub freezer. It all starts with 14% cream, delivered to us twice a week direct from a local dairy. Fresh fruit and luxury chocolate are among the fine ingredients we prepare by hand and add to the cream. Ice, water, and salt are added to the area that surrounds the cannister that holds the ice cream. The right mixture of ice and salt around the container causes the ice cream mixture to freeze creamy and smooth. Paddles inside the container whip the ice cream mixture to keep it constantly stirred. This, along with the brine created by the ice and salt outside the container, help the mixture to rise and double in size. © 2018 Miller's Ice Cream. All Rights Reserved.